Microbial Forensics is a rapidly evolving scientific discipline. In the last decade, and particularly due to the anthrax letter attacks in the United States, microbial forensics has become more formalized and has played an increasingly greater role in crime investigations. This has brought renewed interest, development and application of new technologies, and new rules of forensic and policy engagement. It has many applications ranging from biodefense, criminal investigations, providing intelligence information, making society more secure, and helping protect precious resources, particularly human life. A combination of diverse areas is investigated, including the major disciplines of biology, microbiology, medicine, chemistry, physics, statistics, population genetics, and computer science. 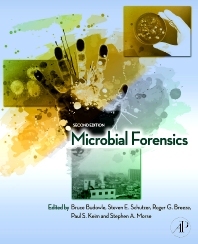 Microbial Forensics, Second Edition is fully revised and updated and serves as a complete reference of the discipline. It describes the advances, as well as the challenges and opportunities ahead, and will be integral in applying science to help solve future biocrimes. Microbial Forensics: Educating the Workforce and the Community; So You Really Want to be an Expert Witness? A Primer for the Occasional Expert Witness; Conclusion – Microbial Forensics, What Next? Dr. Budowle has a lengthy CV and career. Some of his efforts over the last 15 years also are in counter terrorism, including identification of victims from mass disasters and in efforts involving microbial forensics and bioterrorism. Dr. Budowle was an advisor to New York State in the effort to identify the victims from the WTC attack. In the area of microbial forensics, Dr. Budowle has been the chair of the Scientific Working Group on Microbial Genetics and Forensics, whose mission was to set QA guidelines, develop criteria for biologic and user databases, set criteria for a National Repository, and develop forensic genomic applications. He also has served on the Steering Committee for the Colloquium on Microbial Forensics sponsored by American Society of Microbiology, an organizer of four Microbial Forensics Meetings held at The Banbury Center in the Cold Spring Harbor Laboratory, and on steering committees for NAS sponsored meetings. Dr. Budowle has published approximately 600 articles, made more than 720 presentations (many of which were as an invited speaker at national and international meetings), and testified in well over 250 criminal cases in the areas of molecular biology, population genetics, statistics, quality assurance, and forensic biology. In addition, he has authored or co-authored books on molecular biology techniques, electrophoresis, protein detection, and microbial forensics. Steven Schutzer, MD is a physician-scientist who trained and was on the faculty at Cornell University Medical College, New York Hospital, and Rockefeller University, before joining New Jersey Medical School. His research has focused on the interface of the immune system and microbes. Particular areas of research interest are Lyme and Tick diseases, neuroimmunology, and immunology. Dr. Schutzer is board certified in Internal Medicine, Allergy and Clinical Immunology, and Clinical Laboratory Immunology. Dr. Schutzer’s research is funded by the National Institutes of Health and other organizations. Dr. Morse attended graduate school at the School of Public Health, University of North Carolina at Chapel Hill where he received his M.S.P.H. (’66) in environmental chemistry and biology and a Ph.D. (’69) in microbiology. In 1984, he joined the Centers for Disease Control and Prevention (CDC) as Director of the Sexually Transmitted Diseases (STDs) Research Program, National Center for Infectious Diseases (NCID); and in 1996, became the Associate Director for Science of the newly created Division of AIDS, STDs and Tuberculosis Laboratory Research. From 1999 - 2007, he served as the Associate Director for Science, Division of Bioterrorism Preparedness and Response where he worked on national and international bioterrorism-related issues. In 2008, he became the Associate Director for Environmental Microbiology, CDC. He has published 325 peer reviewed articles, books and chapters.